This month we look at “F” – Figure out the move. You have been working hard to prepare your home for this big event, but now is the time to figure out the actual moving details. Many of us may have done our own moving in the past. We packed the boxes, rented the truck, hauled the furniture and survived just fine. However since none of us are as young as we once were using movers is often the best choice. • Get referrals: Ask around for recommendations of good movers or research several companies yourself so you can choose one you can trust. • Get estimates: The moving company will send a representative to your home to assess the amount of things to move, figure the needed packing supplies, determine approximate moving time, and quote what they think the cost will be. These estimates are non-binding which means it is just an estimate and your actual cost could be more or less. Getting several estimates will help you have a good idea of the cost range. The rate per hour is regulated by the state. • Do it yourself: Although doing the packing yourself may save you money you need to be aware that movers are not liable for damage to the items you pack. With this in mind, if you choose to pack, you are better off packing items like books and linens, and leaving the dishes, lamps and other fragile items for the movers to pack. 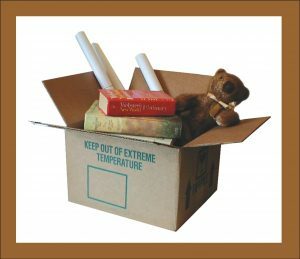 • Create a “Do Not Pack” pile: Whether you are moving yourself or not, there are several things to keep aside. These are things that should travel with you rather than with the movers. This group should include items like your jewelry, checkbook, cell phone and charger, and a suitcase containing a day or two of clothing and necessary toiletries and medicines. • Create an “Essential” box: Sometimes this box called a “last – first” box because it is the last box packed and the first one unpacked. Make sure the movers know to keep this box within reach. It should contain items that need to be easily accessible at both ends of your move. Items in the box might include toilet paper, paper towels, bedding, towels, trash bags, and a coffee or tea pot. Taking time to figure out the packing and moving details in advance will help you simplify and de-stress not only the big day but the whole moving process.